Winter Photography workshop, a trip to learn and photograph the splendor of Yellowstone in winter with a small group of 3 students per vehicle and your professional instructor/guide. 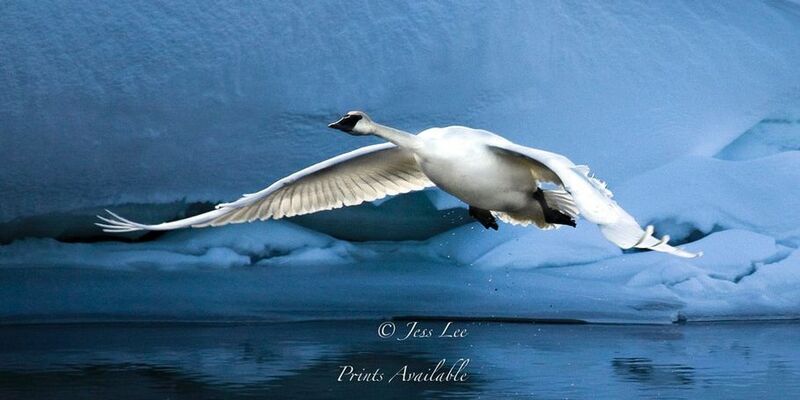 This trip is hosted by long time professional photographer and National Geographic cover photographer Jess Lee. 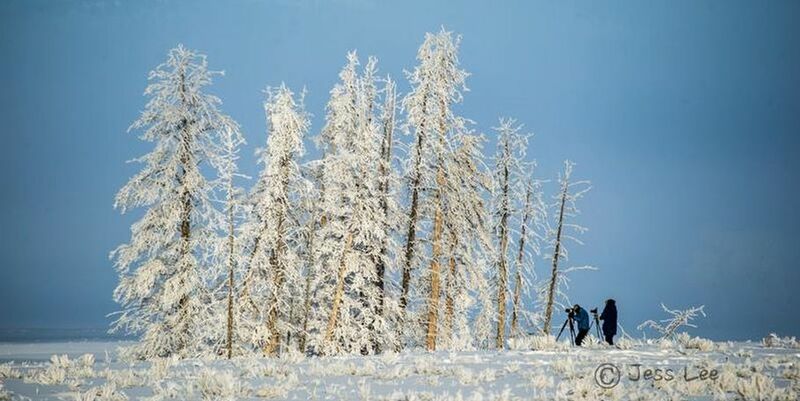 Yellowstone is a winter wonderland where you can capture spectacular photos and learn about winter photography during this special workshop in the Yellowstone ecosystem. You will photograph wintering wildlife, hunting predators, steaming geysers, boiling hot springs, frozen waterfalls and be guided and instructed with a ratio of one guide / instructor to three students. This trip is the best winter, scenery and large mammal photo opportunity on the planet. Combine the dramatic location, the iconic wildlife encounters with the knowledge and expertise of your guides makes this a special trip. We will put you in the best locations and show you how to bring home incredible images from the wonderland of Yellowstone in winter. When we pick you up in Bozeman Montana in one of our luxury 4 wheel drive SUV's. Then you and two other students will be starting your photographic adventure as we travel and photograph through the scenic ranch lands of Paradise Valley Montana on our way to Yellowstone. On this short trip through the north winter range of the worlds first national park you will have a chance to photograph winter Big Horn sheep, Pronghorn Antelope, Elk, Bald Eagle, Whitetail and Mule Deer and the valleys ranch lands in their scenic splendor. An area that is often overlooked by other workshops but give a unique view of the Yellowstone eco system. We will be based in Gardiner Montana surrounded by beautiful snow capped mountains where the wildlife is right outside you door and you are across the Yellowstone river from the park itself. (tip: great photos can be captured from the parking lot). 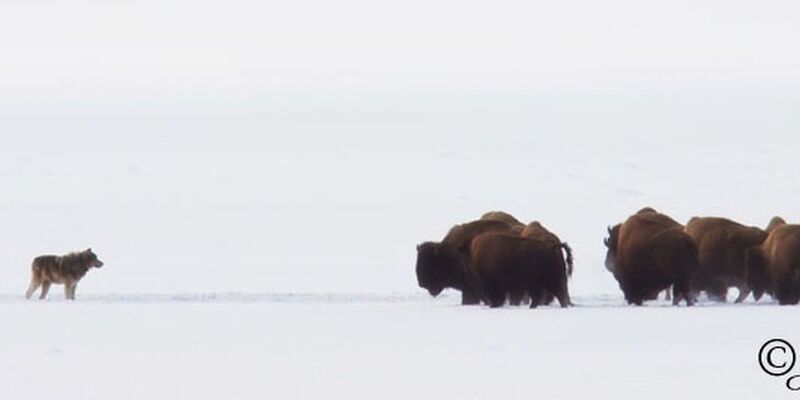 With Jess's and his teams vast knowledge, local contacts and years of experience in Yellowstone we will take you to the best places at the right time to help you to concentrate on capturing the essence of winter in the world's first National Park. From pre dawn to after the last twilight we will hunt for images of the beauty of this land in the grip of winter. 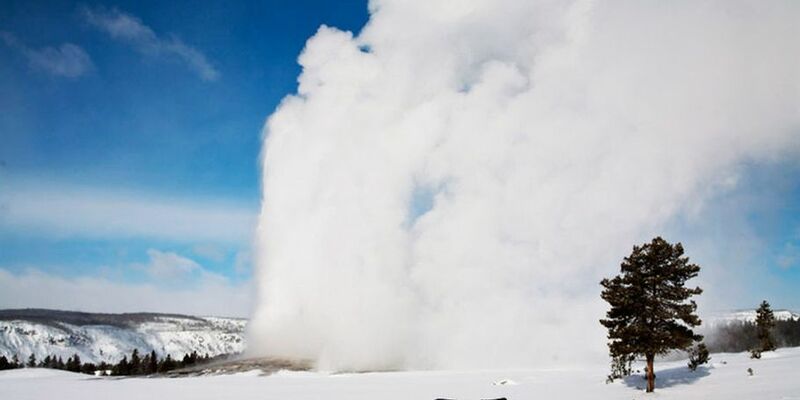 We will visit the steaming geysers and thermal areas of Norris geyser Basin and the interior of the Yellowstone. You will photograph Old Faithful, Grand Canyon of the Yellowstone and the winter wilderness of Hayden Valley. This will all be done from our warm secure modern private snow coach where you can quick escape the coldest extremes where you can warm and secure yourself and your equipment. During our time when we are not in the snow coach we will be photographing Lamar Valley and the other areas of the prime Yellowstone wildlife winter range. Here you will be traveling in a full sized SUV where each photographer will have a window for those quick wildlife encounters that do not allow for time to exit the vehicle. No van hassle here! We will photograph Lamar Valley the wintering home of ice rimed Bison, Elk, Wolves, Moose, Fox, Coyotes, Bighorn Sheep, Mule Deer, Pronghorn Antelope,Trumpeter Swans, and Bald Eagles. 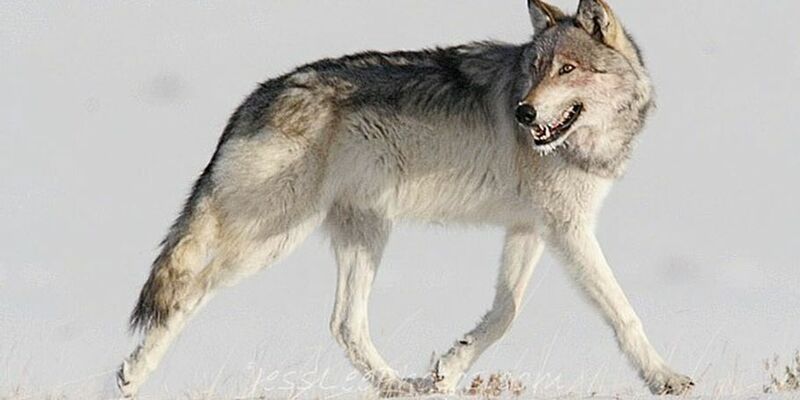 Our quest will key on the master of all hunters, the charismatic wild wolf. Our hunting ground will be the wonderland of Yellowstone in winter with steaming thermal areas, frost covered wildlife, pristine snow covered wild lands. If you have dreamed of photographing wild wolves I feel this is your best chance. 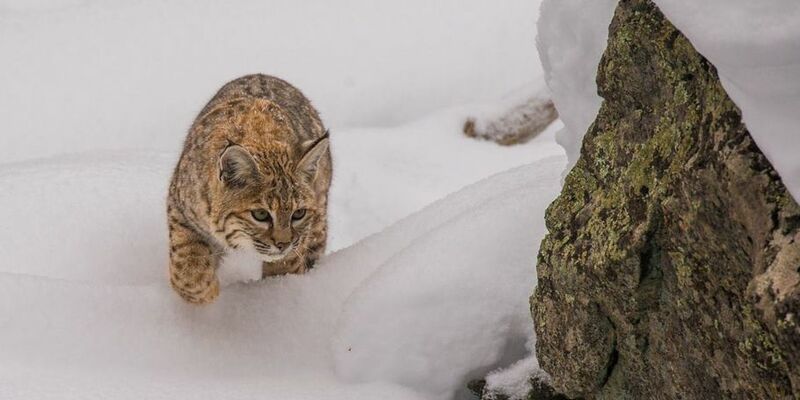 Bobcats, Foxes and Mountain Lions are here and we work hard to have these predators in front of your lens also. Jess has been living, photographing, guiding and instructing in the Yellowstone eco-system for over 30 years. Jess has spent over a hundred days a year photographing Yellowstone and its wildlife. Thousands of his award winning Yellowstone photographs have appeared in publications such as National Wildlife, Sierra, Defenders of Wildlife and Sports Afield. Jess's wild wolf images have appeared in prestigious publications such as covers on National Geographic, National Wildlife and Defenders of Wildlife, and many more wolf images have ben used to promote the reintroduction of this critical species in publications such as Smithsonian and films including Ken Burns recent hit production " National Parks, Americas Best Idea". While most tour leaders come to Yellowstone for a few short weeks a year we are attuned to the local conditions and keep up to date on the wildlife activities by daily contact. In addition we have a vast network of local friends who are constantly reporting to us on wildlife activities.This is your chance to learn from that vast base of experience. $3995. Including Guiding, instruction, breakfast and snow coach, lodging, transportation to and from Bozeman and one of the most unique small group photography experience on the planet. $1000 deposit holds your place. For this trip we recommend you arrive in Bozeman the Saturday before your Sunday morning pickup (7 AM) for our short trip to Yellowstone's. You will be returned to the airport around noon on the final day of the trip for your return flight home.